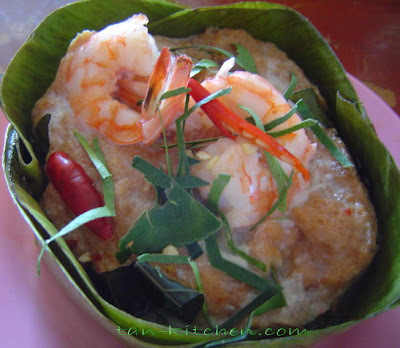 This recipe I adapted from popular Thai steamed recipe "Ho Mok Pla" Thai curries are delicious at the best of times but this one is one of my favourites. But I using prawn for this time. It is quite simple to prepare and takes very little cooking time also. Prepare the topping by heating coconut milk (1/4 cup) in a pot over low heat. Wait until boiling, add rice flour. Stir until mixed well then remove from heat. In a big bowl, mix together fish fillet, shrimp (thin pieces), red curry paste, egg, fish sauce, and sugar. Stir until all ingredients mixed well. Fill the mixture in the bananaleaf cup and then place the shrimp on the top. Put banaleaf cups in the steamer for 15 minutes or until cooked well. Before serving, pour the prepared coconut milk on top of each cup and sprinkle with red chili, kaffir lime leaves, and coriander leaves.